Anyone who was disappointed that Los Angeles-based Carina Round celebrated her 10-year anniversary with a reissue is now redeemed. The singer/songwriter from Wolverhamption who turned down an offer to join the Smashing Pumpkins put up a new single. It's not sugar and spice like the EP she put out two years ago, either. The new single, The Last Time, brings Round full circle to her early years, with her duality intact. She's beautiful. She's tortured. And yet, it's unlike anything she has produced to date. Her vocals come on strong as an invitation and then punish for contributing to her pain. It's the perfect introduction to her next full-length due out in 2012. It's the most irresistible track I've listened to in weeks. The Last Time is epic, passionate and mysterious. Inspired by a letter that someone sent Round, the song deliberately talks about the weather while alluding to something eerie and disturbing that is bubbling up from underneath. But we only see the surface. What makes it the perfect introduction to her upcoming full-length album is she says there is something strange and beautiful going on within every song. It makes for the promise of something extraordinary soon enough. The Last Time is a quest to push past any resistance and become what you want to become. And the video, directed by Scott Rhea, captures every bit of its elegant, haunting, and painful premise. Round transforms herself from her natural beauty into something dark, dramatic, and aggressively deep. Even more remarkable, she stepped up her game by getting deeply involved in the engineering and production. The new approach allowed her to transform what she had initially composed and move this song and others in entirely new directions. Some songs, she says, she completely made over. Given she has been performing with and opening for Puscifer (the side project of Maynard James Keenan) in support of the album Conditions Of My Parole, it's impossible to guess where she finds the time or the fire. But that is one of the things I've always liked about Round. She takes no prisoners. Everything is coming together for Carina Round. Since Artist Direct first streamed The Last Time for one week in October, everything has come together for Round. American Horror Story picked up two of her songs for the show. 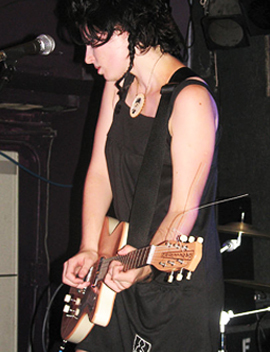 She played on the Late Show With David Letterman with Puscifer. And she opened for Puscifer in my hometown of Seattle. While people are still finding The Last Time video, expect to see the numbers climb. An interesting aside about the video, Round tapped the intriguing vision of Gary Baseman to decorate the set. Every painting you see in the music video belongs to him. Baseman and Round frequently collaborate. She even wrote a nursery rhyme for one of his recent events, introducing his ChouChou character. All in all, if the album is anything like the single (and I have every indication it is), Round is about to release her most artistic, interesting, and delicious album next spring. If you like the find, then The Last Time will have to hold you over until winter. The Last Time By Carina Round Smolders At 9.4 On The Liquid Hip Richter Scale. Round has always been a vibrant force on the alternative music scene. Since 1996, she has supported some amazing acts, anyone and everyone from Annie Lennox to David Gray. But I've always felt her strongest work hits home when she balances that duality where beauty and ugly meet, where everything is raw and instinctive. Round's The Last Time is available on iTunes. You can also find The Last Time on Amazon. Round is currently touring as a member of Puscifer, but she opens some shows too. The Last Time music video is available on iTunes.